GlobalData recently released its global coal cost curves. 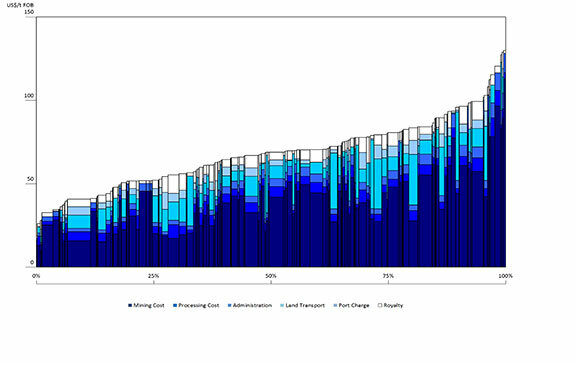 These cost curves are generated by estimating the operating costs of each individual coal mine; the height of each bar represents the cost per tonne of production, while the width represents the total yearly production of coal at that mine. "The power of cost curves"
These cost curves reflect the overall efficiency of each operation and are a useful tool to analyse coal operations in terms of where they sit against their competitors. They also provide a quick way to understand each operations’ operating profit margin (or loss), either by overlaying a price line or deducting the operating cost from a standard price and creating a margin curve. These curves are predominately used by the financial sector, particularly for M&A transactions and debt and equity financing. For instance, Anglo American is currently selling all of its metallurgical coal operations. We can highlight its metallurgical coal operations on a curve, and see how competitive they are. Similarly, these curves are often included in Rule 144A Debt offering memorandums when raising capital in the US. Figure 1. 2015 Global metallurgical cost curve. However, at GlobalData, we have found more suppliers to the mining industry are now interested in this data, so that they can better target their business development team. For example, some lubricant suppliers are using these curves to demonstrate how the adoption of their products can reduce operating costs and hence make a mine more competitive. Similar analysis has been done to demonstrate the advantages of surface miners over traditional truck and shovel operations. Mining costs, the cost of extracting the run of mine ore from the deposit. Process costs, which is the essentially the washing costs for coal. Land transport, typically rail freight. Port charge (the cost a coal terminal charges the producer to load coal). The following curve is a 2015 global metallurgical curve. The curve covers 150 metallurgical coal operations accounting for over 340 million t of metallurgical coal production globally, the majority of which is export production. Overall 30 companies have been included, ranging from the large producers, such as BHP Billiton, Anglo American and Teck Resources, to smaller players, such as Whitehaven, and large steel producers, such as Arcelor Mittal. Cliff Smee is the Head of Analysis at GlobalData.